You are currently browsing the archives for the soups category. When the bomb cyclone hit the New England area a few days ago, I was prepared. The cyclone may have packed bitter cold wind chills and the ability to crush my soul like a popsicle, but I had soup. 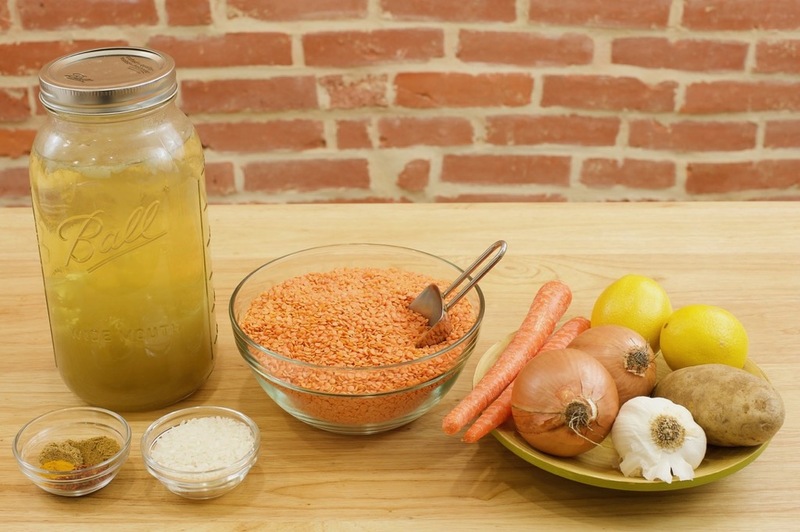 Specifically, Fadi’s red lentil soup. The bomb cyclone didn’t stand a chance. Before I get to the soup though, let me tell you about Fadi. 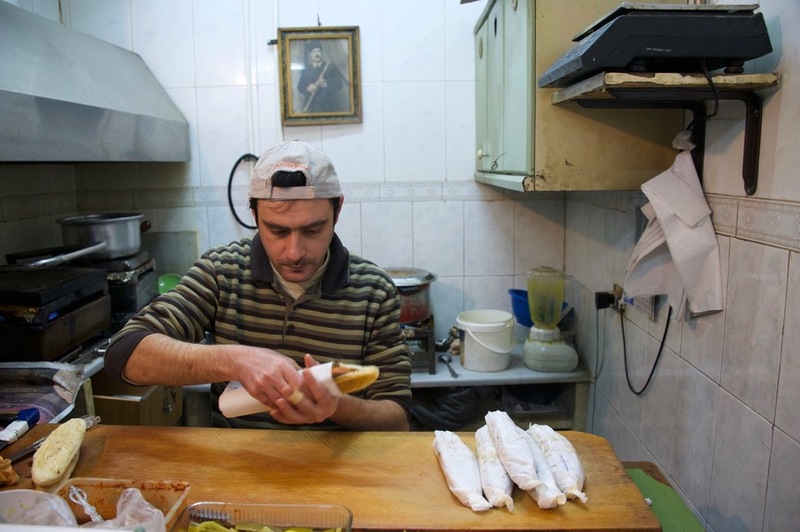 Fadi makes some of the best sujok sandwiches in all of Aleppo. 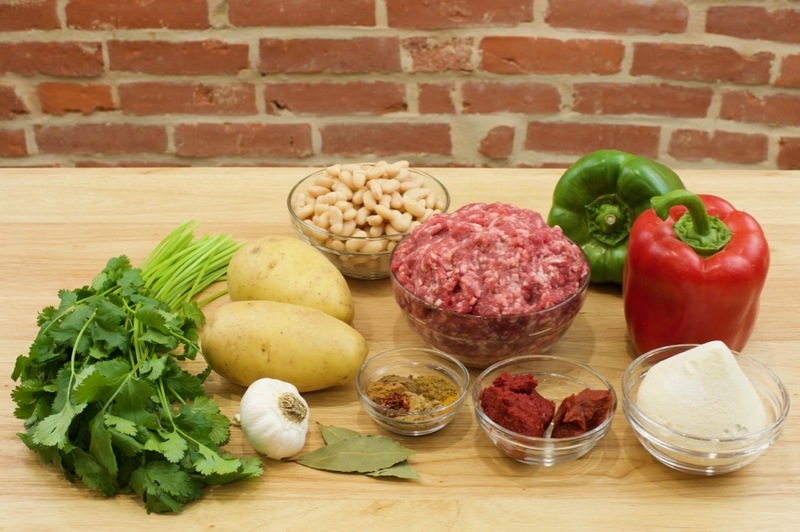 Sujok, if you haven’t had it before, is an Armenian sausage flavored with lots of garlic and a variety of fragrant spices such as cumin, fenugreek, Aleppo pepper, and allspice. That’s what drew me to Fadi in the first place. His sujok is legendary. 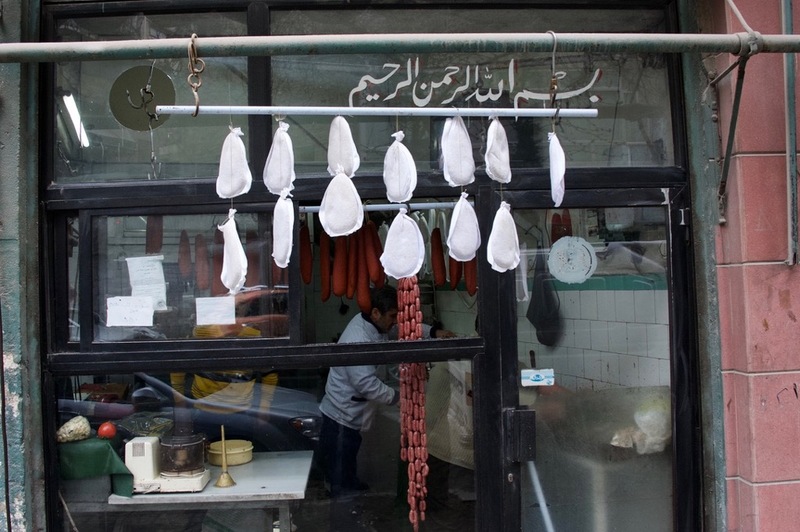 Once the temperature in Aleppo begins to dip, butcher shops throughout the city prepare their own sujok recipes and hang them out front to dry. You can’t miss the aroma of garlic and spices as you walk around the city. Fadi is second generation Syrian. 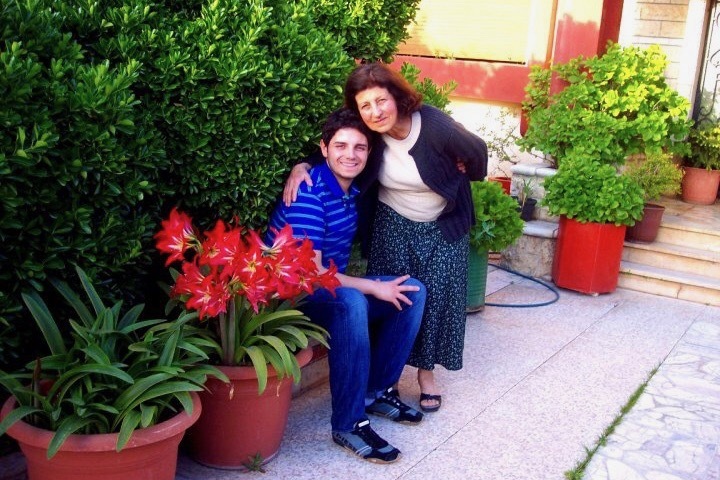 His grandfather fled from Urfa, Turkey to Aleppo during the Armenian genocide. You can see a photo of Fadi’s grandfather hanging above Fadi in the first image. 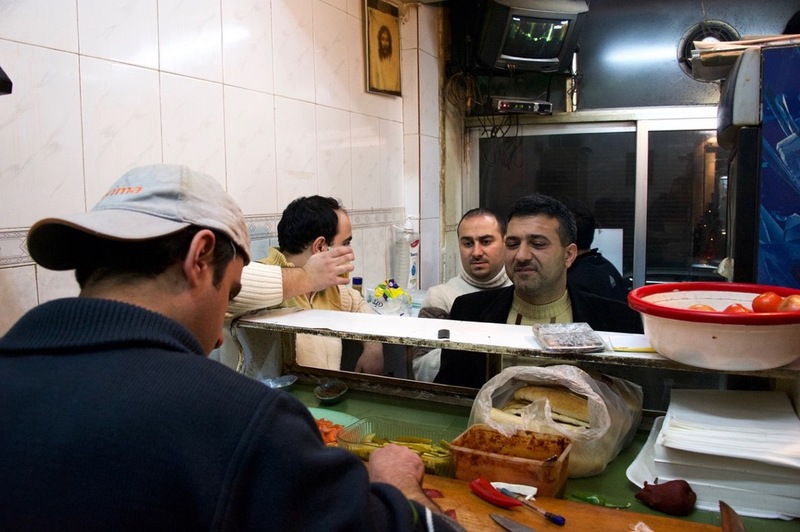 Fadi inherited his small sandwich shop, Abu Jack’s Sandwiches, from his grandfather. When you walk into Fadi’s shop, you’ll be greeted by the scent of sujok sizzling on a sandwich press and the sound of a soccer match playing loudly on the tv hanging above your head. The shop is pretty small — it can barely fit four adults standing in front of Fadi’s counter. This usually means there’s a line out the door. That’s where Fadi’s red lentil soup comes in. In order to keep his customers warm and happy, Fadi retrofitted a coffee dispenser for his simple yet delicious red lentil soup. 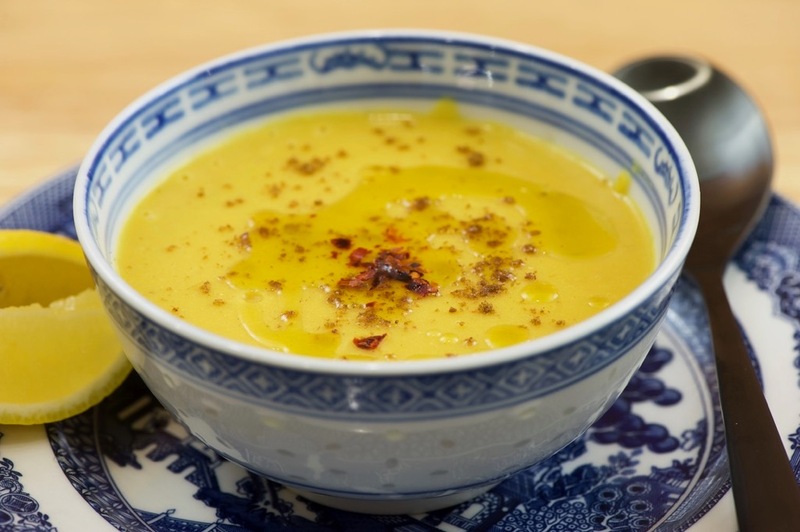 It’s easy for soup to be overshadowed by sujok, but Fadi’s soup is incredible. It merits its own blog post. 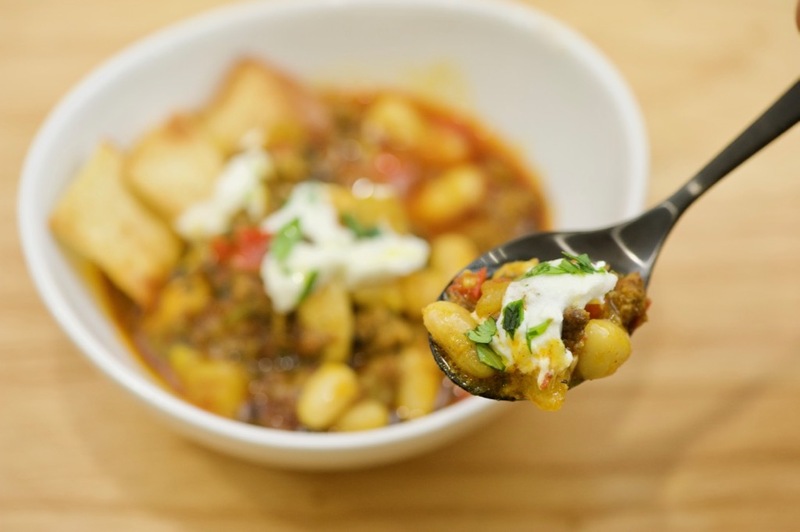 Before winter is over (or if you find yourself in another bomb cyclone), you need this soup in your arsenal. 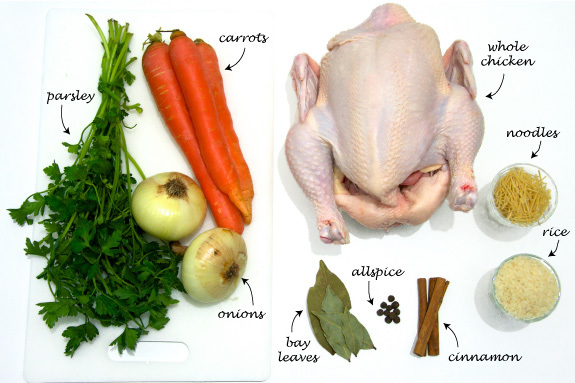 The good news is that the soup is incredibly simple to prepare. The ingredients are simple. 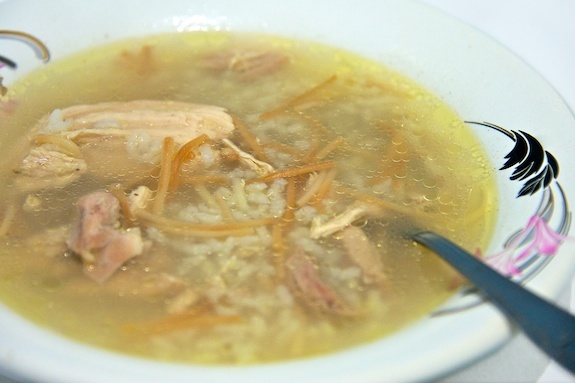 Fadi uses a mix of rice and potato to thicken his soup. 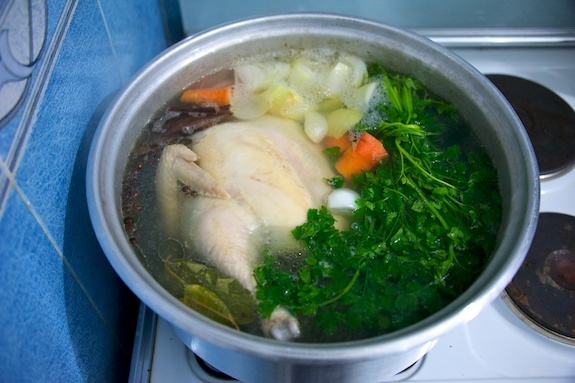 And the soup is very forgiving, so don’t worry about precise measurements. 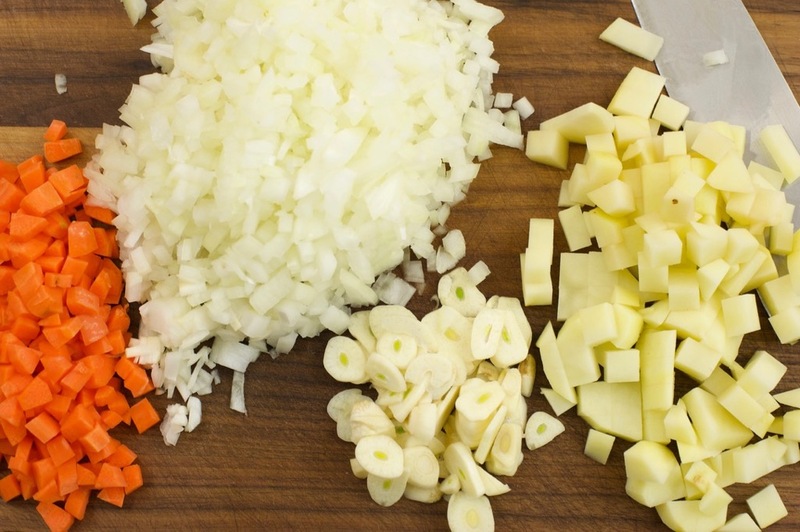 You also don’t need to worry about perfect dicing. 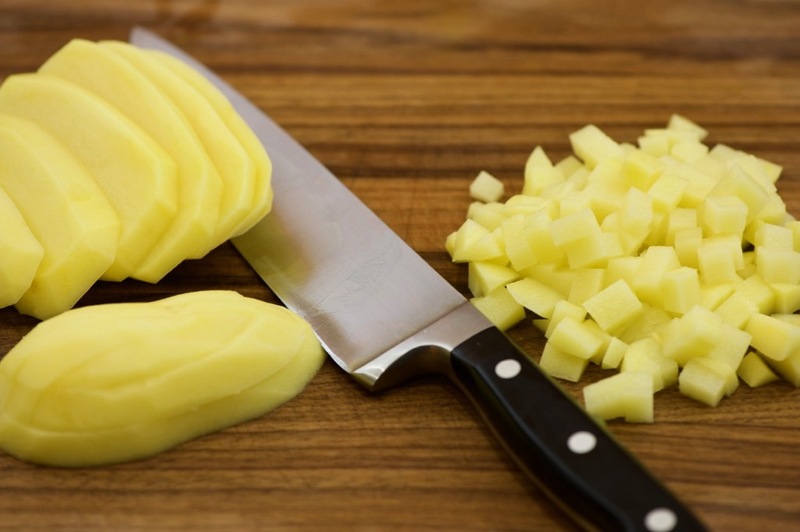 Since the soup is pureed at the end, a rough chop does the trick. 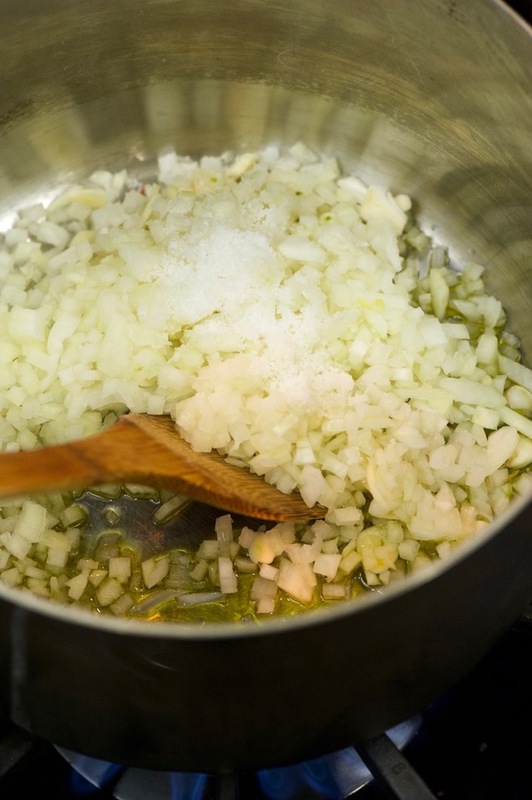 I start by sweating the onions and garlic in a little bit of olive oil. I season with salt and pepper. The key to any good soup is to season in layers. 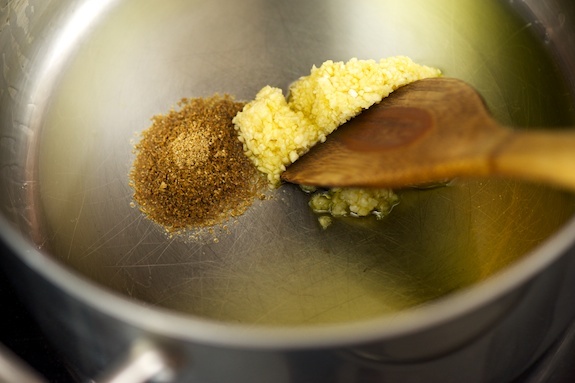 It’s better to season gradually as you go along rather than try to season the dish at the very end. 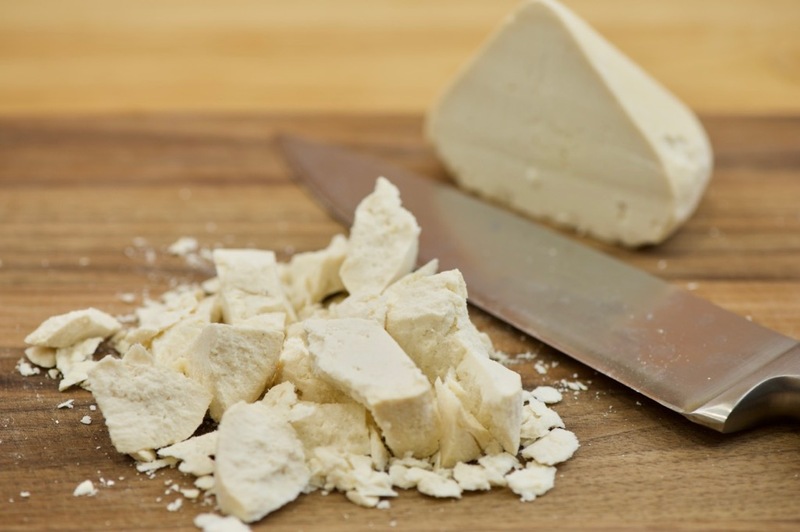 It doesn’t taste the same and you end up using more salt if you season at the last minute. Once the onions have become translucent (~8-10 minutes on medium low heat), you’ll want to add the spices. I don’t add the spices in the beginning because I want to make sure my onions don’t caramelize. It’s also easier to tell when the onions are translucent if they’re not colored by the spices. I like to cook the spices for a couple of minutes, which helps draw out their flavors. 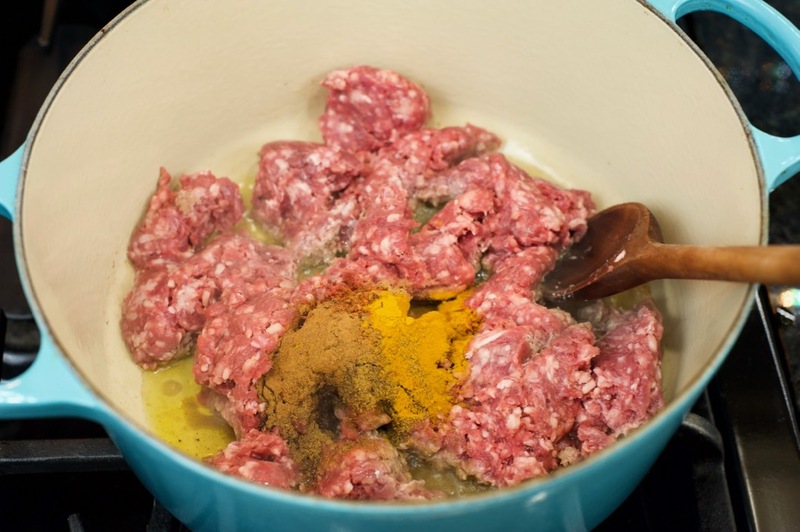 Once you begin to smell the spices, add the rest of your ingredients. 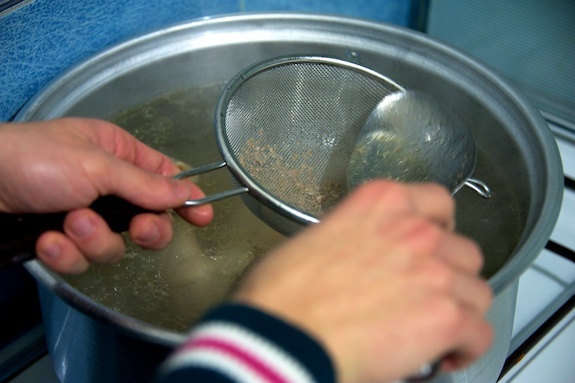 Bring the broth to a boil and then lower the heat to a simmer. 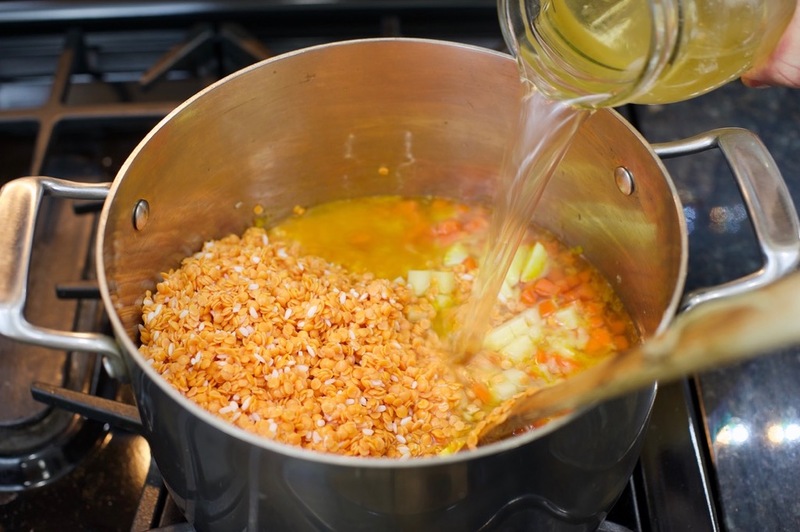 Cover the pot partially with the lid and simmer for 30-45 minutes or until lentils, rice, and potatoes are fully cooked. 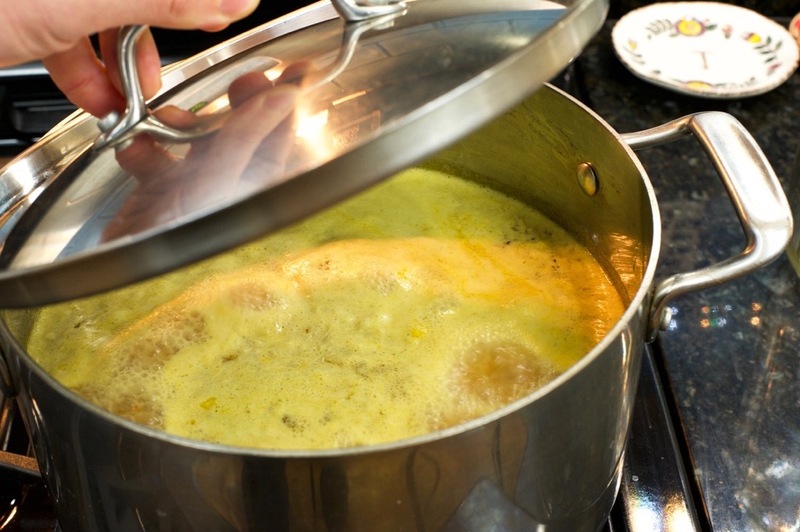 At this point, you can serve the soup as is, but I like to puree the soup for a rich and creamy texture. 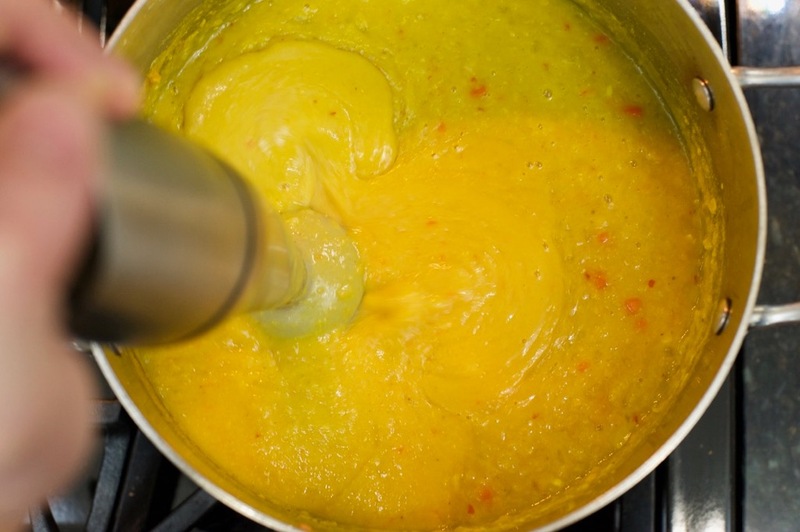 If you decide to puree the soup in a blender, make sure to leave the lid partially open to allow the steam to vent. Otherwise, you’ll end up with soup on your ceiling! This is the perfect job for a hand blender, if you have one. 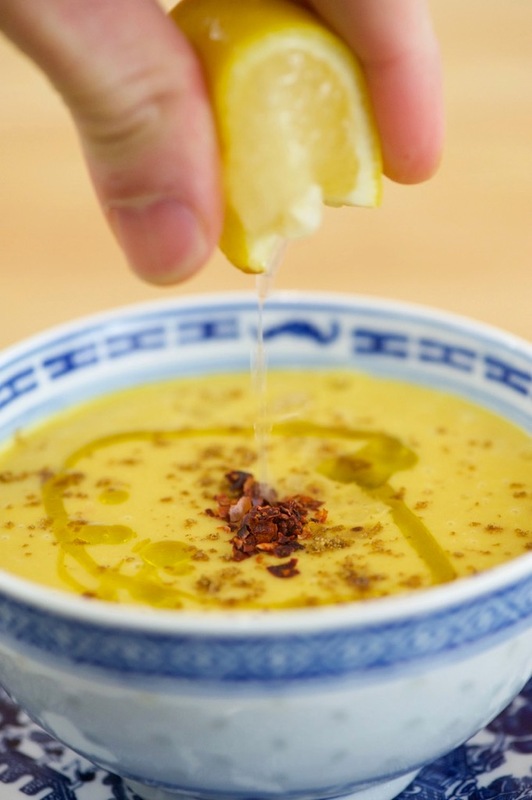 I like to serve the soup with an extra sprinkle of Aleppo pepper, cumin, and a drizzle of extra virgin olive oil. 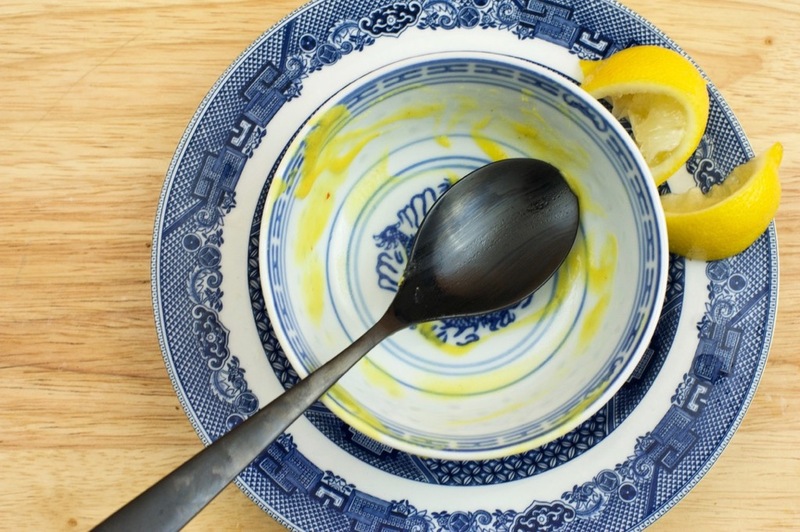 The best part about this soup is that spritz of fresh lemon juice at the end. It brightens up the entire dish! Coat the bottom of a large pot with olive oil. 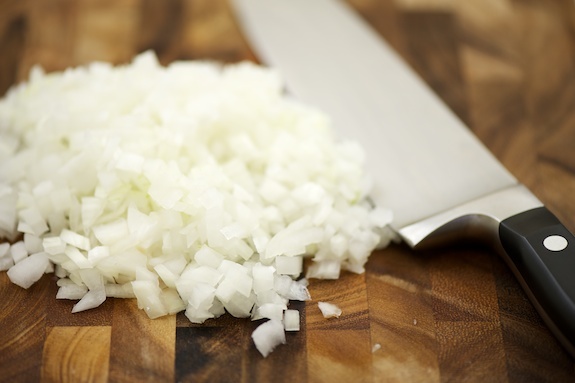 Sweat the onions and garlic with a little bit of salt and pepper over medium low heat. Make sure not to caramelize the onions. You want them to become translucent (~8-10 minutes of medium low heat). 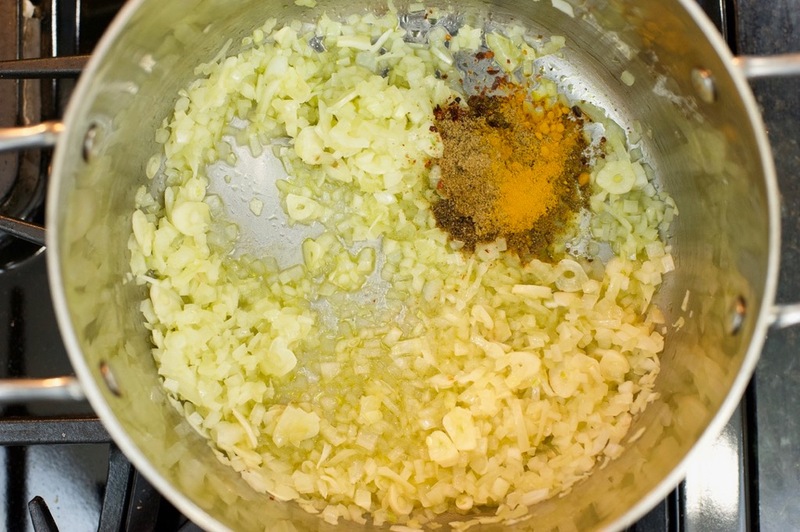 Add the spices (cumin, Aleppo pepper, coriander, and turmeric) to the translucent onions and cook until fragrant (1-2 minutes). 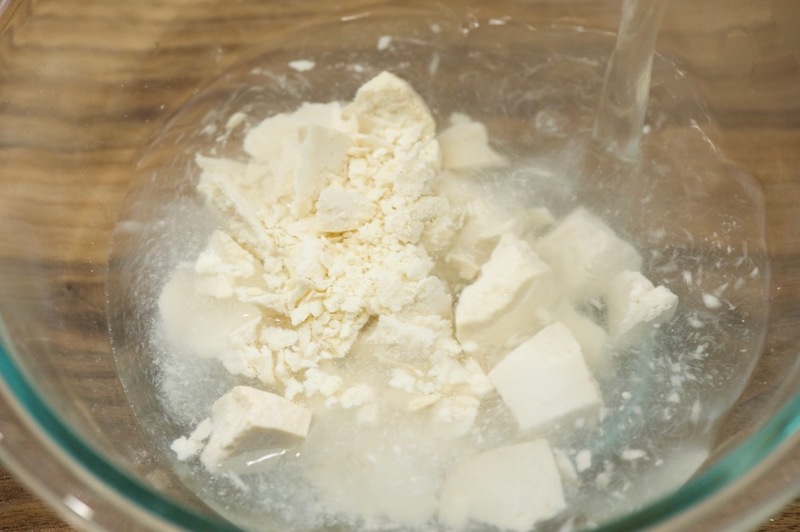 Add the rest of the ingredients and bring mixture to a boil. 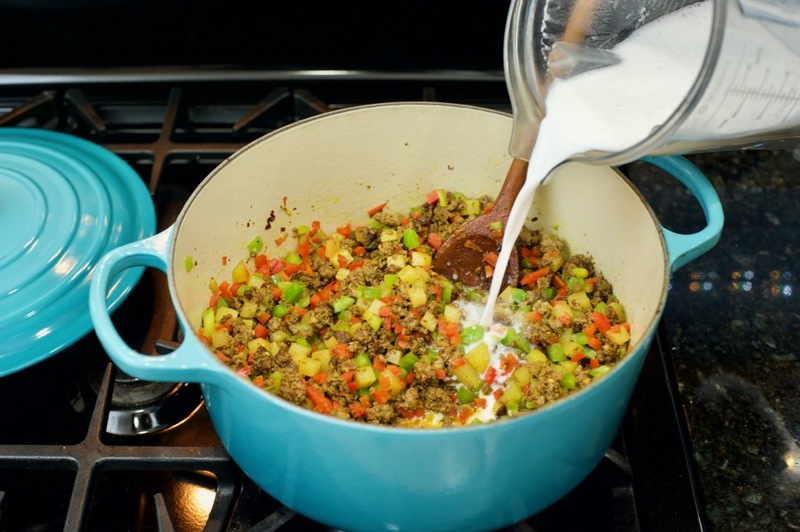 Partially cover the pot with a lid and lower heat to medium low in order to maintain a steady, but gentle simmer. 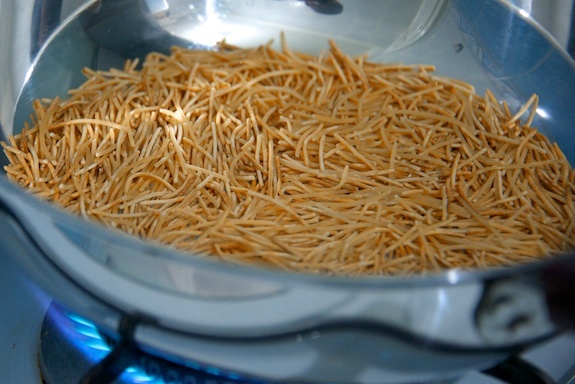 Simmer for 45 minutes or until rice, potatoes, and lentils are fully cooked. Stir occasionally to avoid anything sticking to the bottom of the pot. Puree the soup with a stick blender. 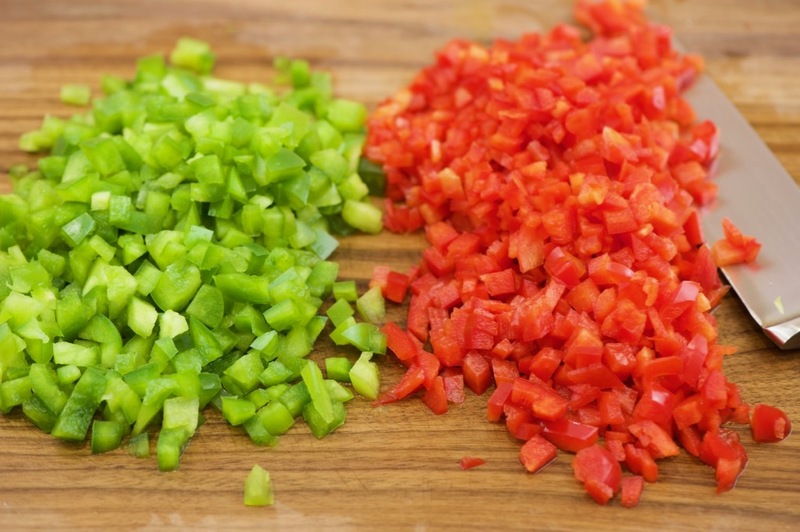 Garnish each bowl with a drizzle of extra virgin olive oil and a sprinkle of cumin and Aleppo pepper. 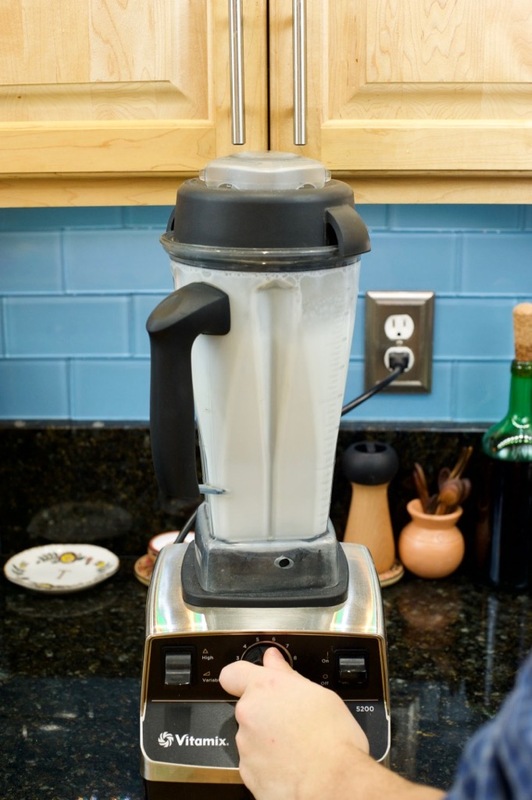 Notes: If you’re using a regular blender to puree the soup, be sure to vent the lid of the blender to allow the steam to escape. 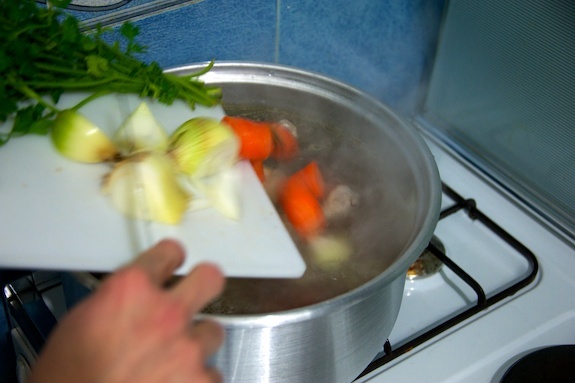 The soup can be made the day before and heated before serving. In fact, it tastes better the next day! The situation in Syria has gone from bad, it skipped worse, and plunged straight into bleak. I needed time to wrap my head around the events of the last seventeen months. 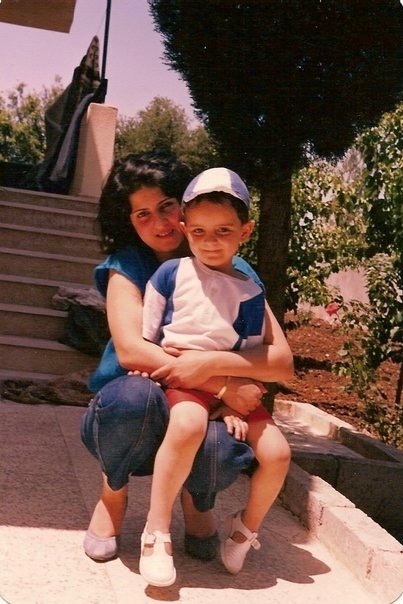 Syria has been on my mind since the day I evacuated, April 26, 2011. My friends Bassel, Zaki, and Karam drove me to a bus station in the outskirts of Aleppo where I boarded an almost empty bus to Lebanon at 2AM. I never imagined things would get this bad. I read newspaper articles, blogs, Facebook posts; I watch videos on YouTube, listen to news reports; I follow vetted Twitter users who are inside Syria; I call friends and relatives on a weekly basis — and still, it is difficult to know exactly what is happening inside the country. My heart aches for all the Syrians who have lost their lives and livelihood during this bloody conflict. And my thoughts and prayers go to all those who remain trapped inside. The reason I decided to write a blog post today, however, is not to discuss politics — at least not directly. I’ve always described my food blog as part of my home. It’s the dining room table where I invite readers to pull up a chair. 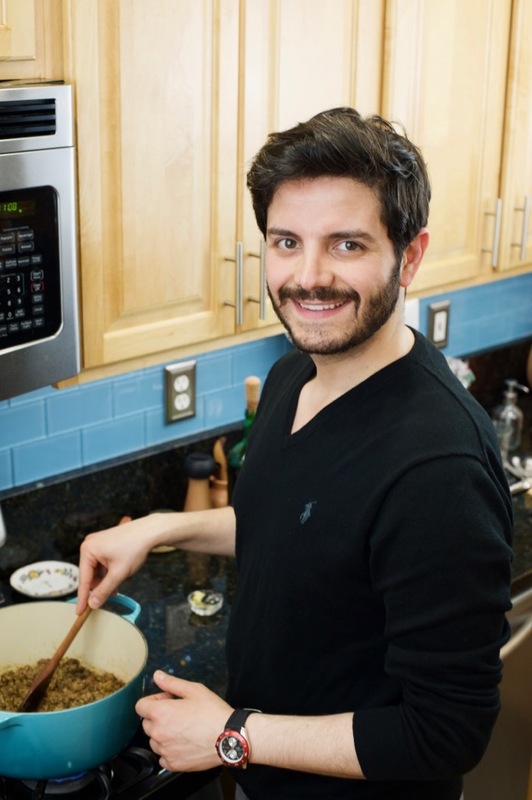 I share stories, photos, and recipes and start a conversation around food and culture. People from around the world can chime in with a simple comment. I almost let myself forget how incredible that feeling is. The feeling of connecting with another person — of breaking bread across the internet. With that, I want to open my door once more and invite you to my digital dinner table. Please, come in. Let me get you something to drink. Part of the inspiration for today’s blog post came from the book, Day of Honey: A Memoir of Food, Love and War by Annia Ciezadlo. The book was published February 1, 2011, while I was still in Syria, but it wasn’t until I arrived to Lebanon that I was able to find a copy at a book store in Beirut. If you haven’t read it already, add it to your summer reading list. 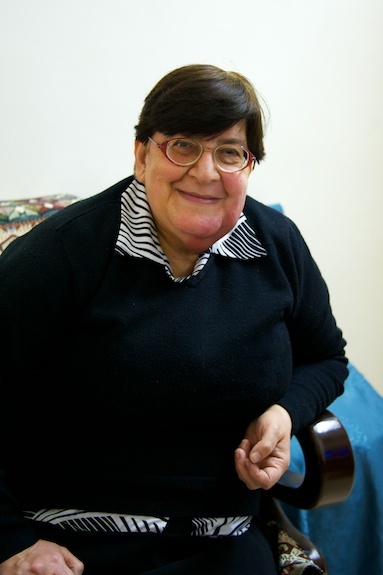 Annia writes about the conflicts in Lebanon and the war in Iraq through intimate stories of people living their lives in a war-torn region. She puts faces to part of the world that can often seem distant and disconnected. Annia writes, “if you want to understand war, you have to understand everyday life first.” I agree. This is a photo from a friend on Twitter, @HumanGraces. 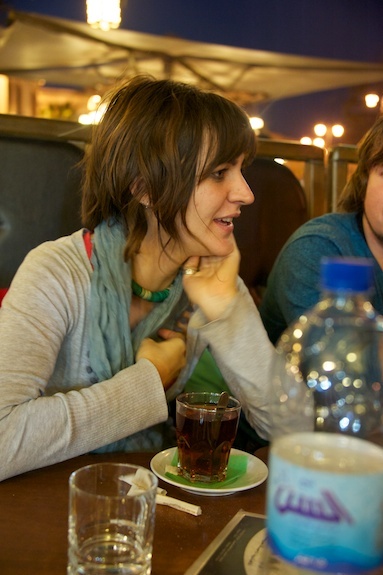 She lives in Aleppo and tweets (mostly in Arabic) about everything from politics to food and family, including random musings from her brothers. 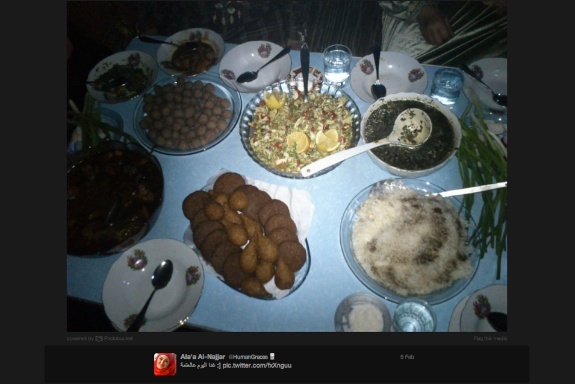 On February 5, 2012 she tweeted this image with the caption, غدا اليوم عالعتمة, meaning, today, lunch in the dark. 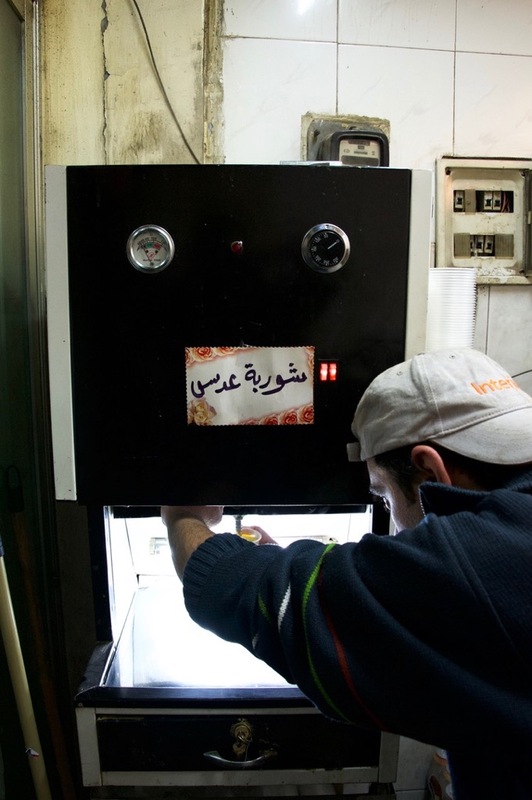 Electricity in Aleppo (at that time) used to get cut eight hours each day; usually four hours in the early afternoon and four hours in the evening. 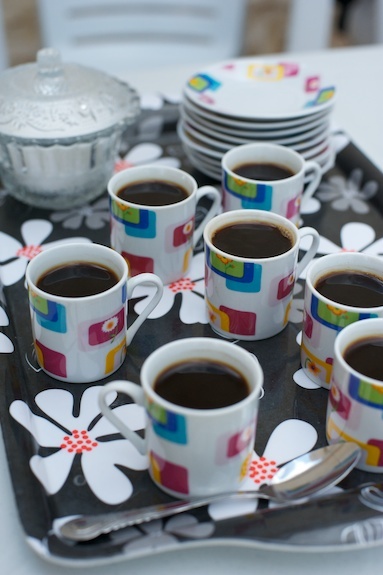 When @HumanGraces tweeted this image my mouth watered, but I also felt a strange sense of nostalgia. There was kibbeh (a classic Levantine meat and bulgur patty), mloukhiyye served alongside rice, and a big bowl of house salad that completes every meal in Syria. That’s when I noticed something else that was interesting, hidden in the shadows of the frame. Those were legs and hands of people sitting together around a dinner table. In the middle of a war. I sent @HumanGraces a Direct Message (DM) on Twitter to ask what the meal was like. Was it quiet? Did politics dominate the conversation? Any resentment or anger? 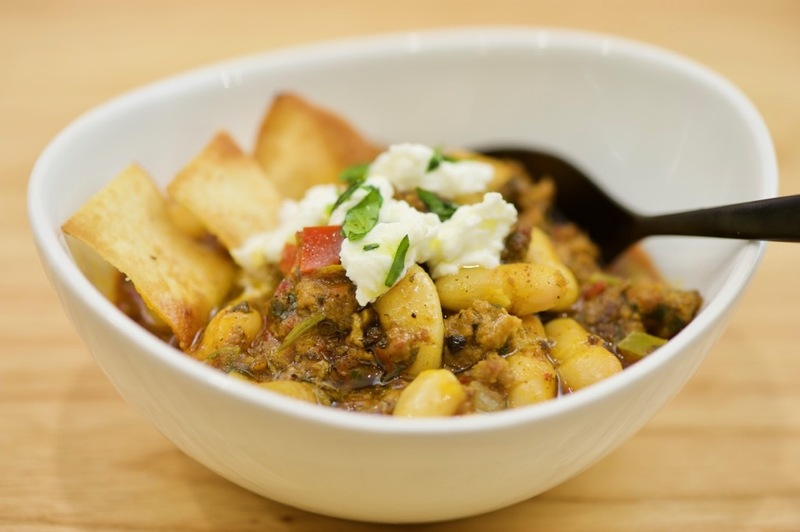 @HumanGraces described the emotions surrounding the meal as a blend of helplessness and joy. They laughed and, she confessed, one of her aunts even ululated. If you only follow the politics and conflicts of the Middle East, or any region, you can easily glance over moments like this; the story of a family that gathers for lunch, clinging to any sense of normalcy in a world that seems to be falling apart. There is a popular saying across the Middle East that says, يوم عسل ويوم بصل (yom a’asal w yom basal), which means, “one day is like honey, another is like an onion.” This is the expression Annia used as part of the title to her memoir. It’s a saying that captures perfectly the blend of emotions: helplessness and joy; an optimism for a better tomorrow. An expression that swallows pain and allows life to continue. In conflicts like the one in Syria, a better tomorrow is usually the most any family can pray for. When I speak with friends and relatives in Aleppo, a lot of them will use the expression, “الله يستر” (Allah yestor) or “may God forbid/protect us.” This means, forbid the bad from happening to us, and thereby protect us from evil. As the conflict in Syria progresses and the country continues to crumble, I understand how this is the best any person, on either side of the conflict, can hope for. Mloukhiyye leaves can give off a slimy texture, particularly when they’re used fresh or frozen. The mloukhiyye I had in Syria was prepared at home from whole, dried mloukhiyye leaves. The cook explained to me that her kids, who are around my age, would not eat it any other way. This was my first time eating mloukhiyye and I loved it. There was barely any slimy texture to the leaves. In Egypt, however, traditional mloukhiyye recipes call for the fresh leaves to be finely chopped, which tends to release more of the mucilaginous texture, resembling that of okra. 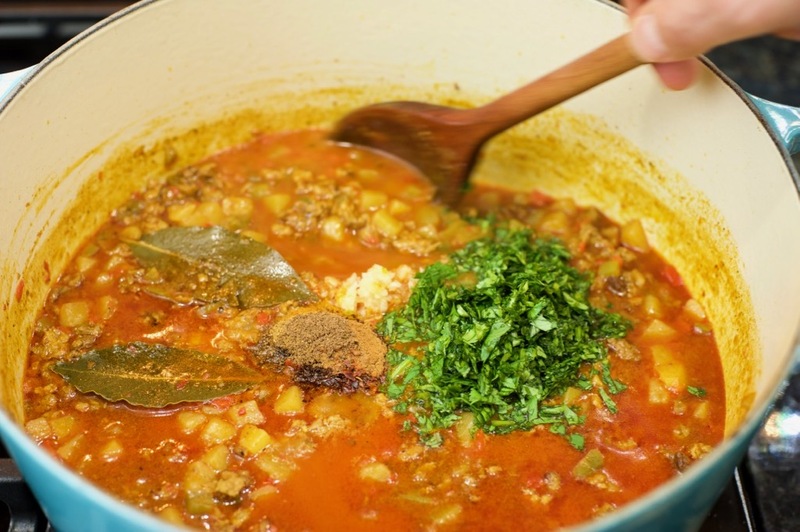 Once you are able to find mloukhiyye leaves, the dish comes together fairly easily. Start off by heating up some ground coriander and garlic in a medium pot. This will remove some of the edge from the garlic and it will also bring out the essential oils in the ground coriander. 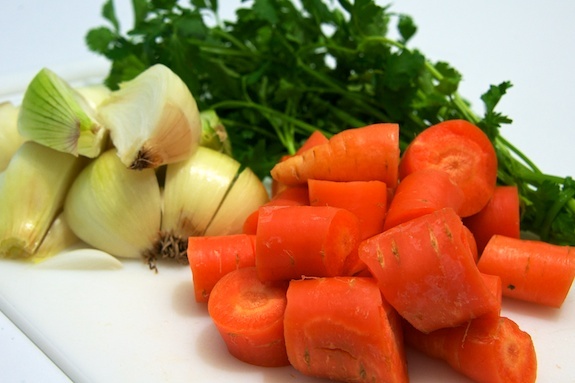 You’ll know when it’s ready; the scent of coriander and garlic will perfume your kitchen. If your nose is stuffy that day, set your timer for 5 minutes, making sure to stir regularly so the garlic does not brown. 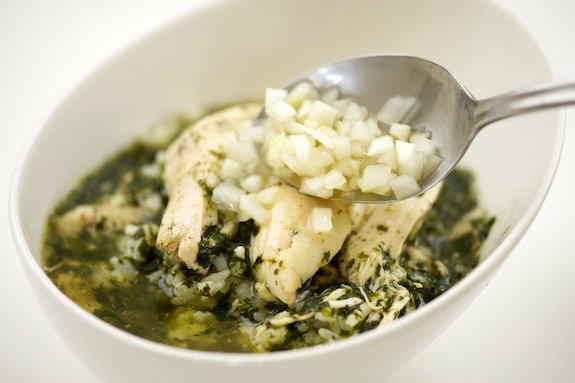 Once you add the broth and the mloukhiyye leaves to the pot, bring the mixture to a boil and finish it off with a splash of lemon juice. This is supposed to help cut down on the slimy texture. How much this actually helps, I’m not sure, but it does add a wonderful bright burst of flavor to the dish. 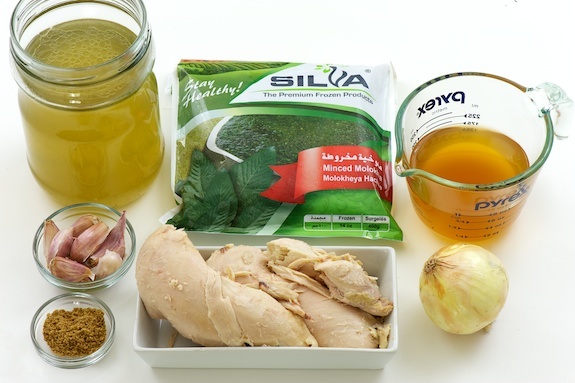 In the Levant it is traditional to serve mloukhiyye with minced onions in vinegar — like a quick pickle. 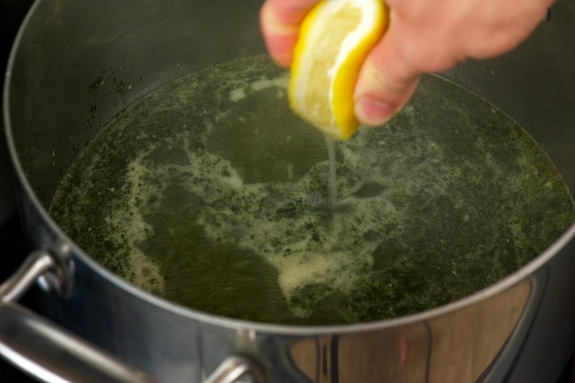 The acid notes in the vinegar, like the lemon juice, help highlight the flavors of the dish. At this point you’re ready to eat. 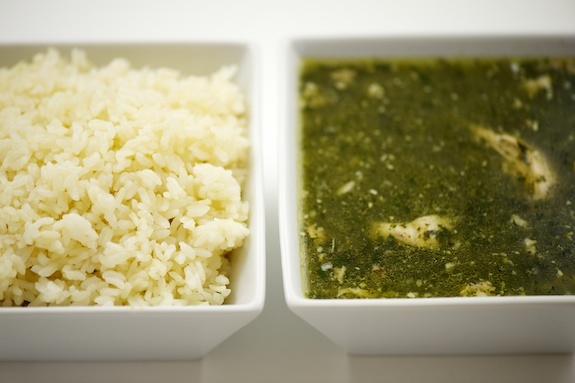 Serve the mloukhiyye and rice in separate bowls alongside the pickled onions for guests to add as much as they would like. 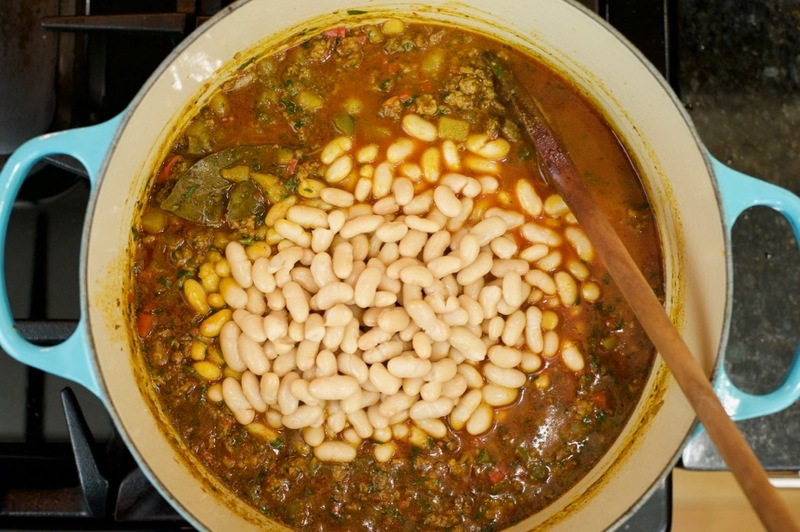 In a medium pot over medium heat stir ground coriander and minced garlic in some butter or olive oil until fragrant. Add the frozen mloukhiyye leaves and boiling chicken stock. Taste for seasoning. 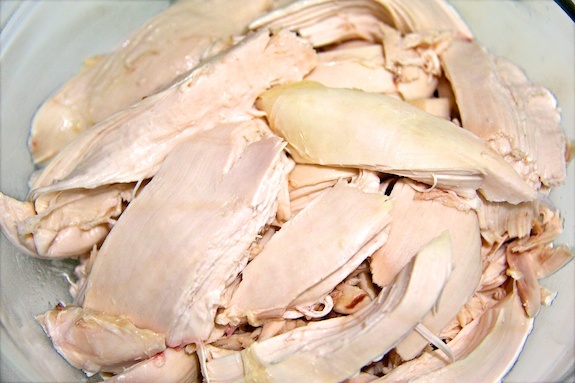 Add poached chicken meat and remove from heat. 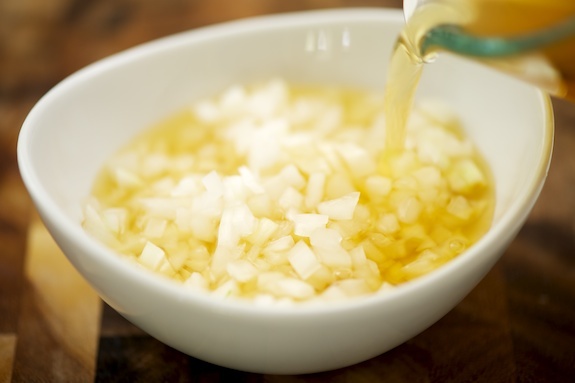 Add diced onion to vinegar and set aside until needed. Serve mloukhiyye over a bed of rice with a side of quick-pickled onions. Thank you for everyone who wrote in with comments and emails asking about the situation in Syria. It has meant a lot. I continue to hope for a speedy resolution — الله يستر (Allah yestor).